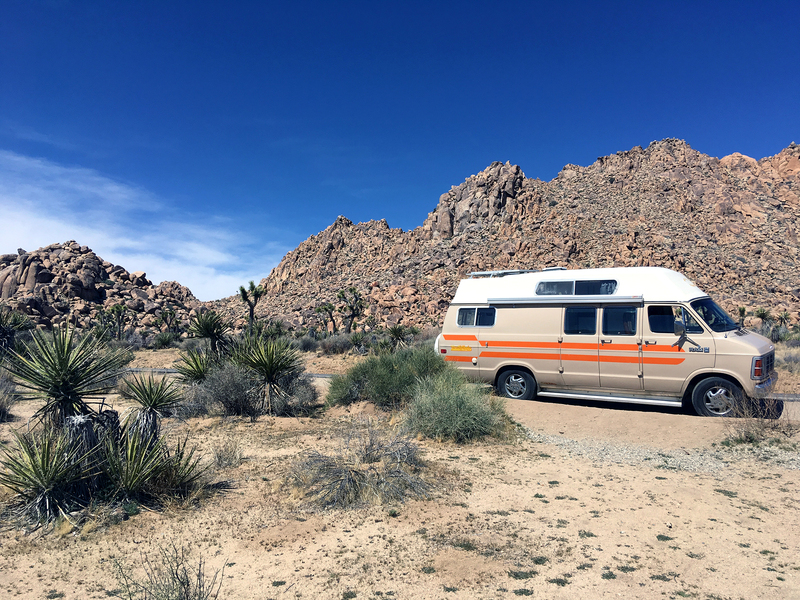 Soaking in our last doses of the hot sun and sandy desert of Southern California in and around Joshua Tree National Park and Los Angeles, CA. It’s expensive as hell. We had heard gas is at least 50 cents a gallon more than other states but be prepared for a full dollar more. We paid $2.50/g in Quartzsite before crossing the state line where gas was $3.79/g in Blythe. We were used to gas prices between $2.20 – $2.50 on average so this was certainly sticker shock. Aside from gas, Justin was paying about $4 more for cigarettes and our grocery bill was at least 20 bucks higher every time. You can’t park on most beaches. 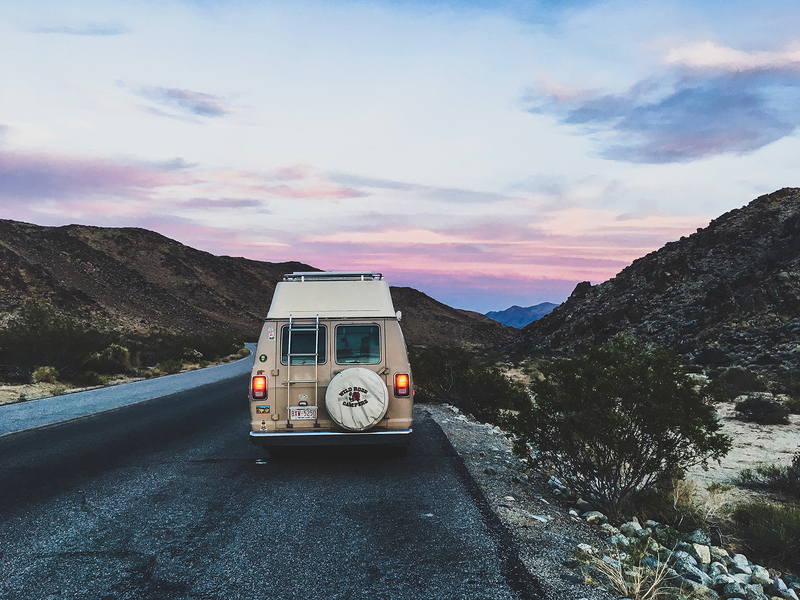 There are plenty of beaches that you can spend the day at while your van is parked in the parking lot (that you probably had to pay to park in), but expecting to make a trip of camping along coastal beaches ain’t happening. California works like Canada. If you like lots of rules, regulations and taxes, move to California. If you like lots of rules, regulations, taxes and being cold, move to Canada. All negativity aside, California is absolutely beautiful and it’s quite obvious why so many people want to live there. Truthfully, I didn’t want to like it because it’s so saturated and expensive but when you’ve got everything from arid desert to lush mountain tops and a roaring coastline, there’s no denying it’s a pretty magical place. Boondocking on the moon. Or Box Canyon. One or the other. Joshua Tree was next on our list and with so many different places to explore within the park, we spent the whole day checking it all out. 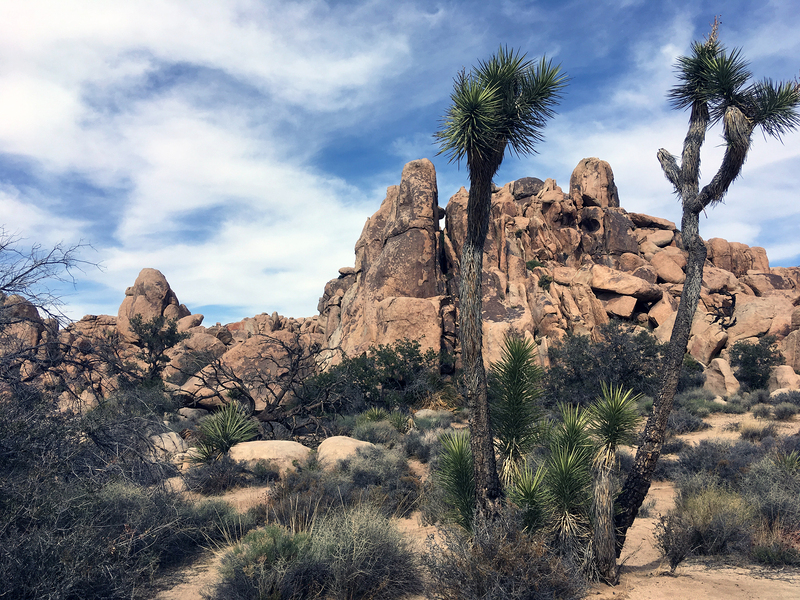 Little tidbit about the name – the trees in that area look like the byproduct of a cactus and palm tree love affair and are called “Joshua Trees” because the Mormons thought they looked like the biblical figure, Joshua. Bit of a stretch I’d say, but to each their own. Anyway, there are plenty of these guys around, along with rocky boulders and cottonwood trees. 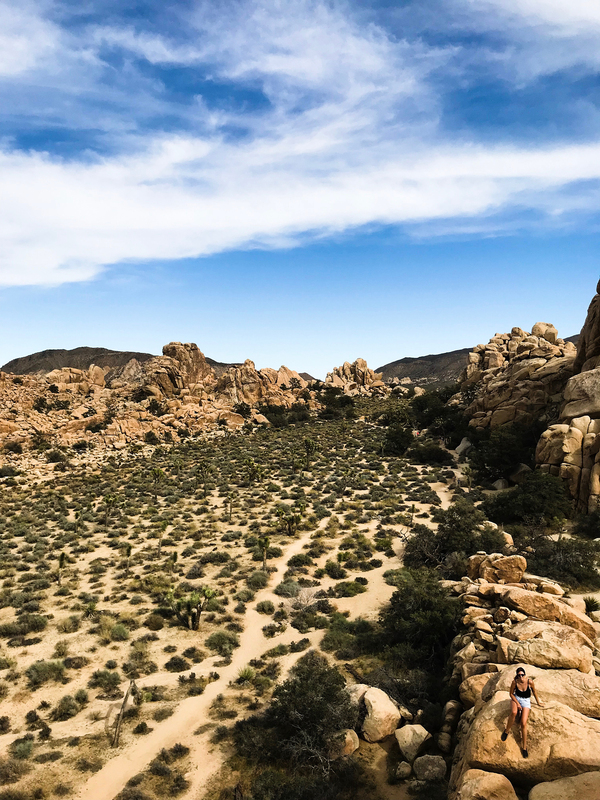 We hiked around Hidden Valley for a while, climbing up rocks and took in the panoramic views that make the park so popular. From there, we made our way to Keys View, which was our favourite spot. 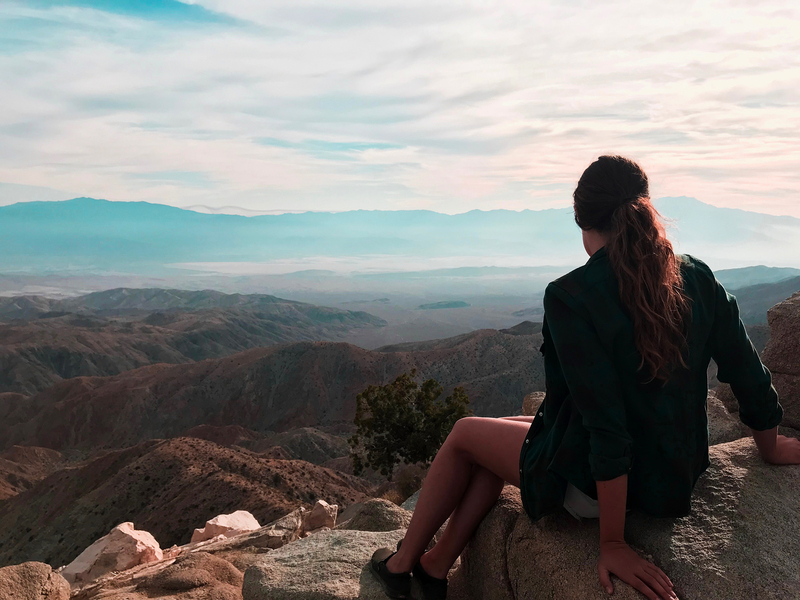 You can see the Salton Sea, Coachella Valley, Palm Springs, the San Andreas Fault and the highest peak in Southern California, the San Gorgonio Mountain. That was a lot of name-dropping but this was a seriously cool spot. Clouds were hanging below the mountain tops while a layer of fog rolled over the Sea. By the time we reached Cottonwood Springs, the sun was setting and it painted the sky with all kinds of vibrant colours. From fiery reds and oranges on one side to pastel shades of pink, purple and blue on the other, everywhere you looked was a sight to see. Once the colourful light show came to a close, things got pitch black so I can’t really comment on those cottonwood trees but I’m sure they’re lovely. For your convenience, there is BLM land immediately outside of the south entrance that made for a great place to hangout and work for a few days. When it’s 30°C, the sun is keeping the battery at 100% and the cell signal is great, why would you want to work anywhere else? We also got a chance to try out using the projector on the side of the van – let’s just say there’s never been a better use for the iTunes Visualizer. 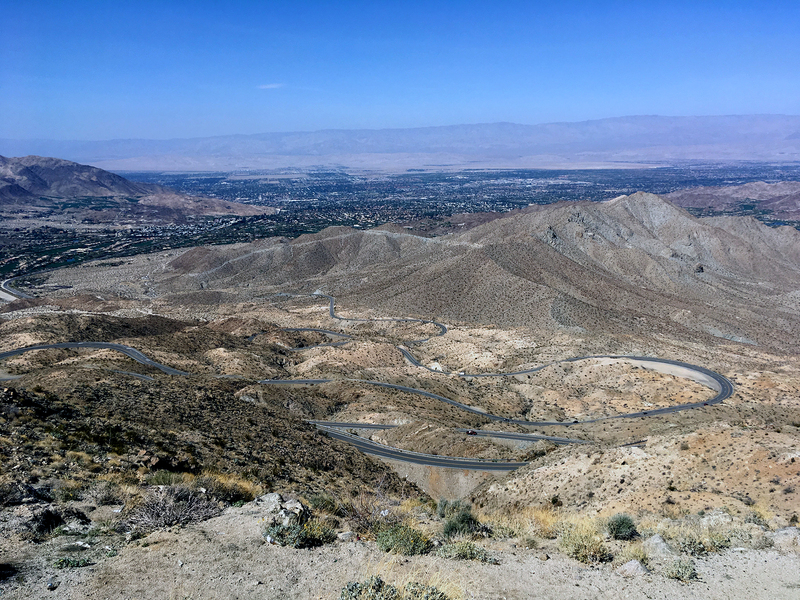 Making our way out of the Coachella Valley area, we drove through the Santa Rosa and San Jacinto Mountains on a crazy twisty windy road to get to the gym. I used to take two buses to get to my gym in Toronto and now we’re driving through mountains – not bad! 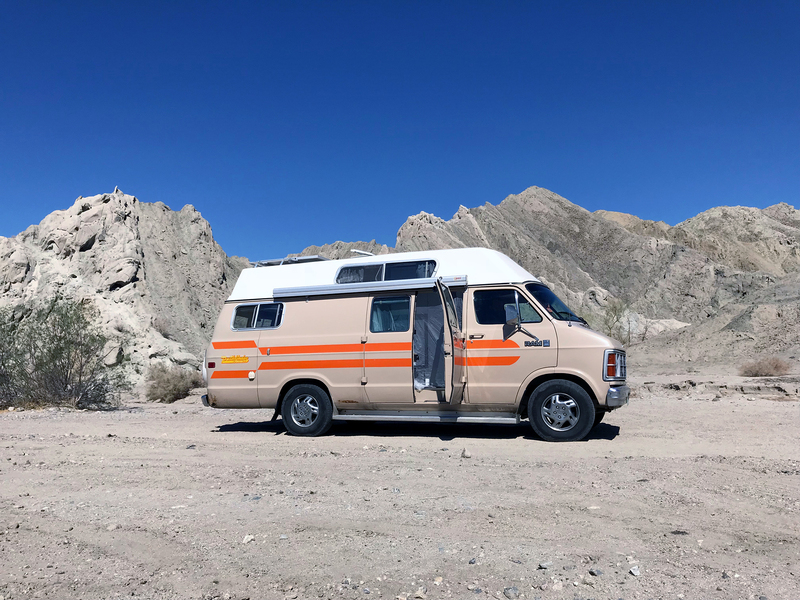 Continuing on this mountain voyage, we made our way into the San Bernardino National Forest to camp for the night and had the place to ourselves. Everyone’s heard LA traffic is crazy so we woke up annoyingly early to get into the city and enjoy as much of the day as we could before finding somewhere quieter to sleep. 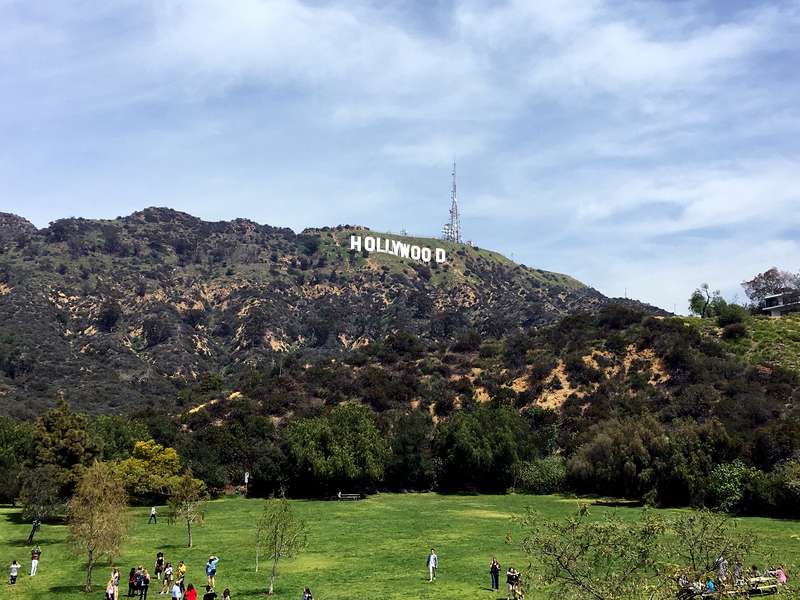 Like any good tourist, we made our first stop in Beachwood Canyon to see that oh-so-popular Hollywood sign. Beachwood Canyon is the “Hollywoodland” that the sign was originally put up by real estate agents to promote. Jump ahead 50+ years and we’ve got a bunch of tourists gawking and a bunch of angry neighbours who don’t want them to be there. We got a decent view but it just didn’t cut it so we disobeyed the “local traffic only” signs (that are there for the sole purpose of scaring you) and headed to Lake Hollywood Park. Ok, let’s just make it clear that this drive was the most hilarious and terrifying drive we’ve had thus far. As Justin pointed out, all the goat roads and switchbacks we’ve taken in the mountains were all preparation for the obstacle course that is driving through the Hollywood Hills. Picture this: the streets are barely wider than our van (and are meant for 2-way traffic), the roads are basically all switchbacks and we were going uphill the whole time on about a 12-15% grade – WHILE other cars are trying to come down and cars are closely behind us making the same voyage. We actually had a Tesla Model X behind us while we barrelled through polluting all over the place. Anyway, we finally reached the park and got the view we were looking for and drove out on the route that we probably should have taken in. Oops! 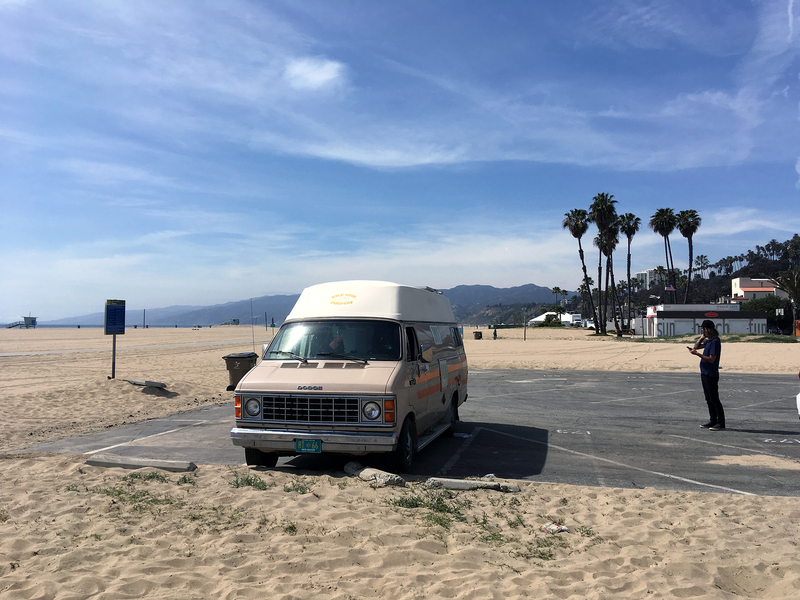 We carried on through Hollywood and Beverly Hills and all those other buzzword places before eventually parking up in Santa Monica and just relaxing on the beach. Of course we barely scratched the surface on LA but I’ve gotta say, it’s pretty damn ugly. With the insane traffic and mindless drivers, we’d like to come back and explore without the van (don’t tell Clementine I said that). It’s a big city that would be much easier to scoot around and find a place to park in in a smaller vehicle. In terms of car camping, the city of Los Angeles has a map that shows you exactly which streets it’s legal to vehicle dwell in. 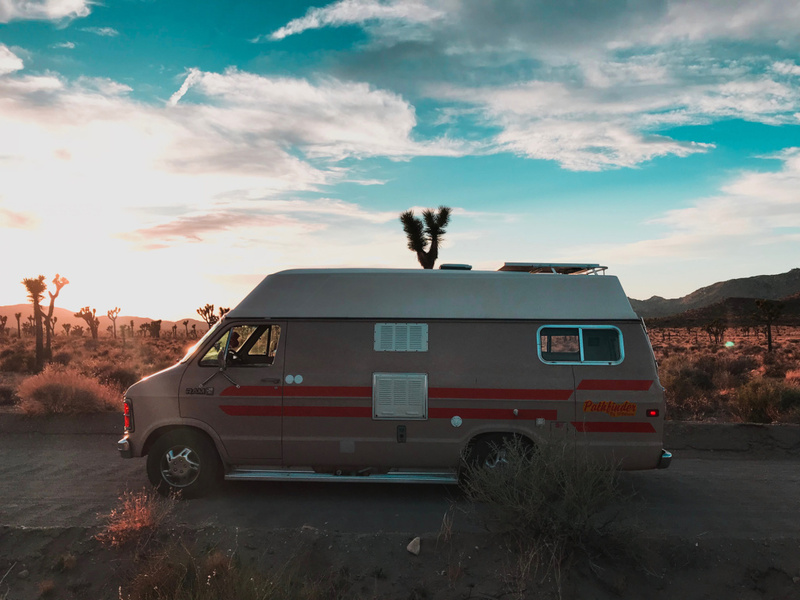 That’s generally awesome to hear but finding one of these spots not already inhabited by a crusty RV is the challenge, along with trying to have a peaceful sleep while parked on Hollywood Blvd. We were ready to get as far out of the city as possible. 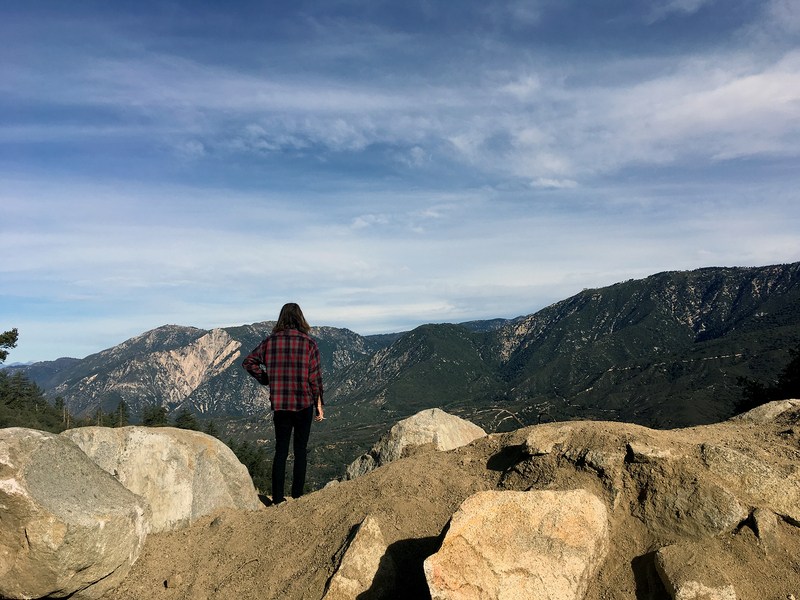 We committed to the 3 hour drive into the northern bit of Los Padres National Forest where we stayed a few days at Aliso Campground. It’s a free spot but has designated sites with fire rings and vault toilets. We rarely take a day to not work or drive so this was a much needed break, especially after battling the LA traffic that didn’t let up from Santa Monica to Santa Clarita. This was one of those drives that seemed to drag on forever but there was a solid 40 minute portion where we drove through wine vineyards and it smelled absolutely amazing. California, you’re beautiful and you smell good but you come at a high maintenance price tag. If only your inhabitants would realize that and stop littering!! So many spots are covered in trash and it’s a huge bummer to see. We’re off to Central California next and hoping for more views and less garbage. Just found your site shown on Facebook. Will follow.